Dr. Khichi is a New Jersey native who has called Georgia home since 1995. Dr. Khichi earned a degree with high honors in Microbiology from the University of Georgia. He went on to complete medical school at the Medical College of Georgia. Dr. Khichi completed a fellowship researching the biochemical and clinical manifestations of thyroid cancer, which earned him a national research grant and provisional patent for his work. He completed his ENT residency training at the University of Alabama-Birmingham. Dr. Khichi specializes in the treatment of head and neck cancer, sleep disorders, allergy, nasal and sinus disease, voice, hearing and balance disorders, and swallowing in both children and adults. 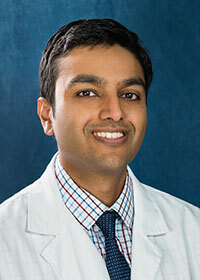 He has also trained in robotic surgery for both head and neck cancer and sleep apnea. Dr. Khichi applied his passion for leadership and community service by serving on the program review committee during his residency, the Medical Association of Georgia during medical school, and the Honors Program student council during college. Dr. Khichi, his wife and their dog live in Alpharetta. He enjoys swimming, baseball, tennis, reading, and travel.